It doesn’t matter if it is 11pm or 2am. Anyone seeking solidarity during a long night awake with pain can find a virtual friend on the Twitter #Painsomnia hashtag or by mentioning it on other tags frequented by people living with a chronic disease. Painsomnia is a patient-generated term for the vicious cycle of pain and sleep deprivation or fatigue related to a chronic condition or its treatment. Evolving from social media discussions, painsomnia is a shorthand description that helps people relate to each other in posts about being prodded awake by pain and being unable to find a comfortable position in bed or to “settle down” for sleep and rest. Anxiety and frustration about lack of sleep and its impact on functioning the next day often accompany patients’ painsomnia experiences and virtual discussions. While many people living with a chronic disease, such as inflammatory arthritis, experience painsomnia, there is no research that defines patients’ experience of painsomnia. A “PubMed” search yields no research that uses this terminology. Alternatively, “chronic pain and sleep” and “arthritis and sleep” are proxy search terms to find research that provides insights into painsomnia. Perhaps unsurprisingly, there is substantial evidence that people with arthritis and other painful chronic conditions have trouble sleeping. Which Came First: Chronic Pain or Lack of Sleep? Nearly 8 in ten people who live with chronic pain complain of poor sleep. One 2016 study reported that chronic pain is “associated with symptoms that may impair a patient’s quality of life, including emotional distress, fatigue, and sleep disturbance,” highlighting the pain’s disruption of restful sleep. The authors point out that clinicians who focus on pain management may be neglecting to address sleep issues. And since poor sleep is associated with lower pain tolerance and an increased risk of chronic pain, lack of clinical attention to sleep disturbance may be neutralizing pain management efforts. The relationship between chronic pain and disturbed sleep is likely “bidirectional,”1, where one exacerbates the other. But there is not yet adequate evidence from clinical research to guide health care providers and patients in defining the particular combination of symptoms with clinical criteria and in specifying when and how they should best be addressed. 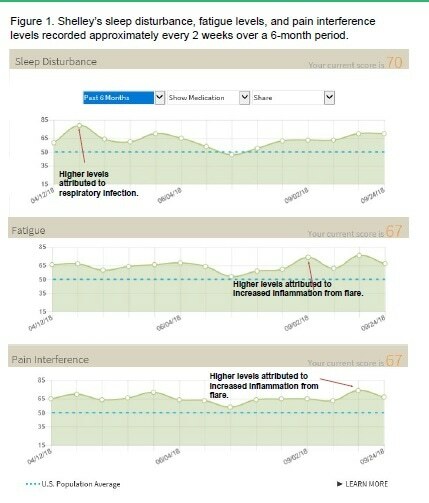 The poster analysis included several months of data measuring Pain Interference, Sleep Disturbance and Fatigue from the National Institutes of Health (NIH) Patient-Reported Outcomes Measurement Information System (PROMIS) submitted by a CreakyJoints member with rheumatoid arthritis (RA) using the ArthritisPower™ research registry’s mobile app. ArthritisPower participants can select from over 80 validated, longitudinal measures that track different symptoms. The app also enables overlay of medication information and free text symptom notes to see how changes in treatment and behavior affect symptoms over time. The patient research team reviewed the RA patient-participant’s symptom data over time and read through notes she recorded in app for additional explanation of changes in her disease activity and treatment. Overall, we found that days when the member slept poorly or felt especially tired were also days when she experienced spikes in pain. What the patient described as painsomnia also coincided with RA flares cold or acute illness, or use of glucocorticoid (steroid) medications. While the term painsomnia may not be familiar to rheumatology professionals, it is an important concept for patients to use with their doctor when describing a cycle of pain, lost sleep, fatigue and lack of productivity. In this case study, the patient brought her data to the physician and they discussed what changes could be made to her treatment and lifestyle to improve both her pain and sleep. They elected to try a modified diet (with less gluten and dairy), increased exercise, and better sleep hygiene, all of which seemed to decrease her episodes of painsomnia. On a related note, sleep hygiene is an area where research is needed since there is scant information on how people’s rituals and habits as they prepare for sleep affected their experience of chronic pain or other arthritis symptoms. In this absence, health providers may need to do more to educate patients about sleep hygiene since it seems closely linked to painsomnia. 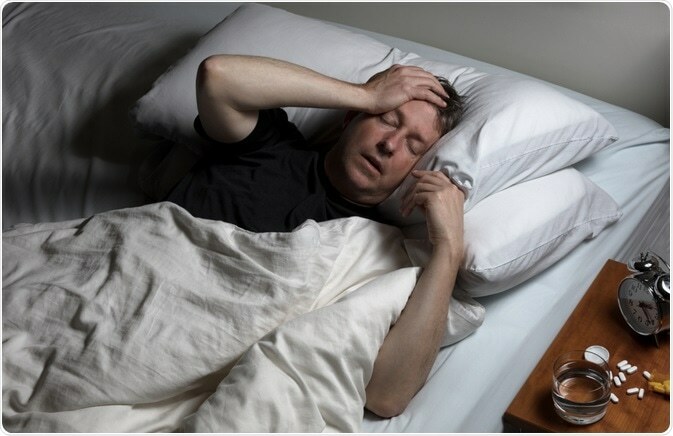 Factors that can be controlled by patients include avoiding stimulants before bed (caffeine, nicotine, alcohol, and others), creating a sleep routine with a regular bedtime in a room devoted just to sleep (and not to work, TV or other distractions), exercising early in the day and eating a lighter meal at night. Improved sleep hygiene is just one possible way to address painsomnia, but more research is needed to understand the interplay of chronic disease, pain and sleep, as well as the most effective approaches to improve patient’s outcomes in these areas.